Every time I visit Annapolis, Maryland, I have to stop at Uncle Bob’s Fudge Kitchen. Uncle Bob’s is a classic tourist shop, crammed to the rafters with magnets, key chains, mugs, Naval Academy t-shirts, Chesapeake Bay cookbooks, and “don’t bother me, I’m crabby” paraphernalia. In the front are large windows, where trays of fudge, candy, and caramel apples the size of softballs issue their siren’s call to all who pass. Uncle Bob’s peanut butter fudge is my true favorite, but their chocolate fudge is excellent as well – not too sweet, with a creamy texture. This frosting reminds me a bit of that fudge; I first used it on a devil’s food cake about eleven years ago. Mike took the cake to his office, and his colleagues proclaimed it worthy of the blue ribbon at the county fair. To this day, that statement is among the highest praise I’ve ever received. The recipe below yields enough to frost two 8-inch layers or one 9×13 sheet cake. 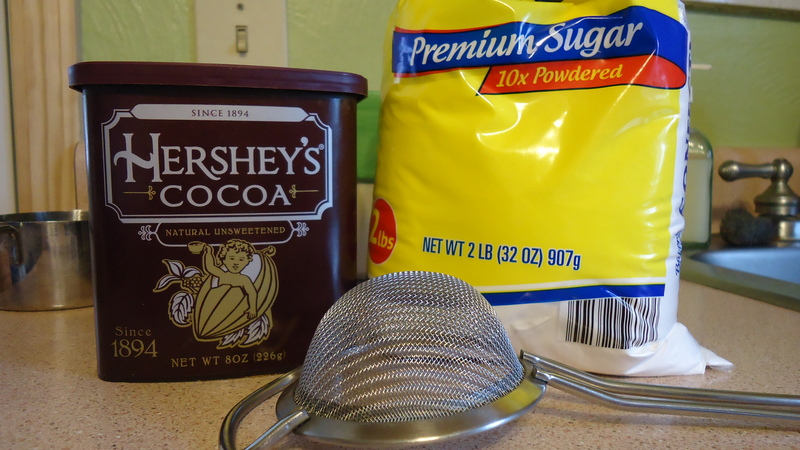 Combine powdered sugar and cocoa powder. Add butter, boiling water, and vanilla. Beat on low speed until ingredients are just combined, then increase speed to medium and beat for 1 minute.